Which direction does gear ‘B’ turn ? Which direction does gear ‘C’’ turn ? So far you have read about ‘driver’ gears, ‘’driven’ gears and gear trains. An ‘idler’ gear is another important gear. In the example below gear ‘A’ turns in an anticlockwise direction and also gear ‘C’ turns in an anticlockwise direction. The ‘idler’ gear is used so that the rotation of the two important gears is the same. Is the speed of gears A and B the same ? In one sentence explain what an ‘idler’ gears does. It would be very difficult to draw gears if you had to draw all the teeth every time you wanted to design a gear system. 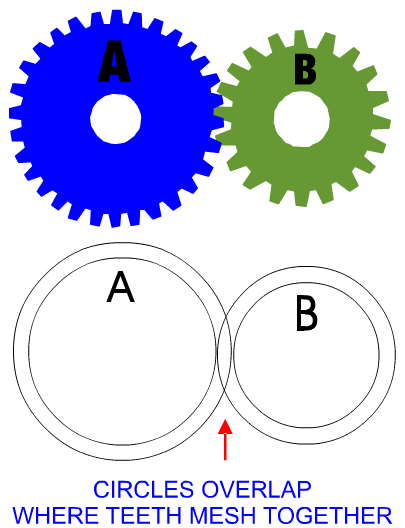 For this reason a gear can be represented by drawing two circles.